1. First and foremost, of course... The Song. 2. (Leontopodium alpinum), one of the best-known European mountain flowers, belongs to the sunflower family (Asteraceae). 3. Flowering stalks of edelweiss can grow to a size of 3–20 cm (in cultivation, up to 40 cm). 5. Edelweiss is a protected plant in many countries, including Bulgaria, Croatia, Switzerland, France, Italy, Germany, Spain (Ordesa National Park), Slovakia (Tatra National Park), Slovenia (in Gorizia and Gradisca since 1896, in Carniola since 1898), Austria (since 1886) and Romania (since 1933). 6. 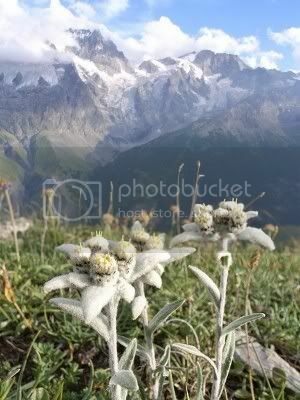 The Edelweiss flower has since time immemorial been valued as medicine against the ailments of men and their beasts, as powerful Talisman to ward off evil and of course as the "Ultimate Love Charms" of the mountain. 7. Love struck young men would try to endear themselves by collecting Edelweiss from those hard to access crags and ledges in the High Alpine of Europe. During these quests many died from falls, or succumbed to exposure, insufficiently prepared for sudden weather changes. 9. Edelweiss was a badge of Edelweiss Pirates (Edelweisspiraten)—the anti-Nazi youth groups in Third Reich. It was worn on the clothes (e.g. a blouse or a suit). 10. In its bid for the 2014 Winter Olympics the city of Salzburg uses an Edelweiss flower as the emblem. 11. Established 1907 by the Austrian-Hungarian Army for their alpine troops, the sign was used in WWII by the Wehrmacht Gebirgsjäger—here as Edelweiss cap badge. 12. The story goes that once, long, long ago, the Alps were far taller than they are these days. In those days, atop one of the snowcapped, precipice filled mountains lived an Ice Queen. She was said to be fair as snow and hauntingly beautiful. She was served by faithful gnomes, who lived with her on those slopes. The Queen would sing melodiously and her sound would lure many a shepherd to lose his way in the mountains and come upon her abode. However beautiful she was, she had a flaw; her heart was frozen cold as if it were made of pure ice.